Recognia has detected a "Hanging Man" chart pattern formed on iShares Core S&P U.S. Growth ETF (IUSG:NASDAQ). This bearish signal indicates that the stock price may fall from the close of $57.00. Tells Me: The price may have reached the top of the recent uptrend, showing it has been susceptible to selling pressure. The Hanging Man appears during an uptrend, displaying a long lower shadow with a small real body at the top of the range. The price may have reached a top and due for a reversal to the downside. This bearish pattern can be seen on the following chart and was detected by Recognia proprietary pattern recognition technology. Recognia has detected a "Triple Moving Average Crossover" chart pattern formed on iShares iBoxx $ High Yield Corporate Bond ETF (HYG:NYSE). This bearish signal indicates that the stock price may fall from the close of $87.62. Tells Me: The price is generally in an established trend (bullish or bearish) for the time horizon represented by the moving average periods. Moving averages are used to smooth out the volatility or "noise" in the price series, to make it easier to discover the underlying trend. By plotting the average price over the last several bars, the line is less "jerky" than plotting the actual prices. In the triple crossover method, a bullish signal is generated when a faster moving average (4 bar) crosses above an intermediate moving average (9 bar), which in turn crosses above a slower moving average (18 bar). In this state, the price is likely in an established uptrend. The opposite is true when the 4 bar crosses below the 9 bar which in turn crosses below the 18 bar, triggering a bearish event. This bearish pattern can be seen on the following chart and was detected by Recognia proprietary pattern recognition technology. Recognia has detected a "Price Crosses Moving Average" chart pattern formed on VANECK VECTORS HIGH-YIELD Municipal INDEX ETF (HYD:NYSE). This bullish signal indicates that the stock price may rise from the close of $31.33. Tells Me: The price is generally in an established trend (bullish or bearish) for the time horizon represented by the moving average period (21, 50 or 200 bars). Moving averages are used to smooth out the volatility or "noise" in the price series, to make it easier to discover the underlying trend. By plotting the average price over the last several bars, the line is less "jerky" than plotting the actual prices. A bullish event is generated when the price crosses above the moving average, and in this state, the price is likely in an established uptrend. The opposite is true when the price crosses below the moving average, triggered a bearish event. This bullish pattern can be seen on the following chart and was detected by Recognia proprietary pattern recognition technology. Recognia has detected a "Hanging Man" chart pattern formed on GUGGENHEIM S&P 500 PURE VALUE ETF (RPV:NYSE). This bearish signal indicates that the stock price may fall from the close of $70.97. Recognia has detected an "Inside Bar (Bullish)" chart pattern formed on POWERSHARES NATIONAL AMT-Free Municipal BOND PORTFOLIO (PZA:NYSE). This bullish signal indicates that the stock price may rise from the close of $25.49. Tells Me: The balance between buyers and sellers, recently dominated by the bears, is evening out. We may see higher prices ahead. An Inside Bar develops during a strong downtrend, when the trading range is completely within the boundaries of the prior bar. This suggests the balance between buyers and sellers is becoming more evenly balanced i.e. a weakening in power for the bears and increasing in power for the bulls. This bullish pattern can be seen on the following chart and was detected by Recognia proprietary pattern recognition technology. Recognia has detected a "Price Crosses Moving Average" chart pattern formed on iShares Floating Rate Bond ETF (FLOT:NYSE). This bearish signal indicates that the stock price may fall from the close of $50.94. Tells Me: The price is generally in an established trend (bullish or bearish) for the time horizon represented by the moving average period (21, 50 or 200 bars). Moving averages are used to smooth out the volatility or "noise" in the price series, to make it easier to discover the underlying trend. By plotting the average price over the last several bars, the line is less "jerky" than plotting the actual prices. A bullish event is generated when the price crosses above the moving average, and in this state, the price is likely in an established uptrend. The opposite is true when the price crosses below the moving average, triggered a bearish event. This bearish pattern can be seen on the following chart and was detected by Recognia proprietary pattern recognition technology. Recognia has detected a "Shooting Star" chart pattern formed on WISDOMTREE SMALLCAP DIVIDEND FUND (DES:NYSE). This bearish signal indicates that the stock price may fall from the close of $28.32. Tells Me: The recent rally is approaching its top, as the balance between buyers and sellers evens out and the price backs off of its high. A star has a small real body that gaps away from the large real body of the previous bar. The small real body represents a deadlock between buyers and sellers. Meaning the buyers have given up some of their control and the uptrend is weakening. In the Shooting Star, the real body is near the low of the range and the upper shadow is long. This pattern shows the price could not sustain the strong rally and backs off to close near its low. This top pattern is a warning sign for an impending reversal. Recognia has detected a "Hanging Man" chart pattern formed on iShares Russell 2000 Growth ETF (IWO:NYSE). This bearish signal indicates that the stock price may fall from the close of $200.59. Tells Me: The price may have reached the top of the recent uptrend, showing it has been susceptible to selling pressure. The Hanging Man appears during an uptrend, displaying a long lower shadow with a small real body at the top of the range. The price may have reached a top and due for a reversal to the downside. Recognia has detected a "Price Crosses Moving Average" chart pattern formed on iShares U.S. Treasury Bond ETF (GOVT:NYSE). This bullish signal indicates that the stock price may rise from the close of $24.53. This bullish pattern can be seen on the following chart and was detected by Recognia proprietary pattern recognition technology. Recognia has detected a "Double Moving Average Crossover" chart pattern formed on Consumer Discretionary Select Sector SPDR Fund (XLY:NYSE). This bullish signal indicates that the stock price may rise from the close of $106.59. Tells Me: The price is generally in an established trend (bullish or bearish) for the time horizon represented by the moving average periods. Moving averages (MA) are used to smooth out the volatility or "noise" in the price series, to make it easier to discover the underlying trend. By plotting the average price over the last several bars, the line is less "jerky" than plotting the actual prices. In the double crossover method, a bullish event is generated when a faster moving average crosses above a slower moving average (21-bar MA crosses 50-bar, or 50-bar MA crosses 200-bar). In this state, the price is likely in an established uptrend. The opposite is true when the faster slips below the slower moving average, triggering a bearish event. Recognia has detected a "Double Bottom" chart pattern formed on VANGUARD REIT ETF (VNQ:NYSE). This bullish signal indicates that the stock price may rise from the close of $75.91 to the range of $79.00 - $79.70. The pattern formed over 23 days which is roughly the period of time in which the target price range may be achieved, according to standard principles of technical analysis. Tells Me: The price seems to have reached a bottom after failing to break through a support level and ultimately rising higher in a sign of reversal to a new uptrend. The Double Bottom pattern forms during a downtrend as the price reaches two distinct lows at roughly the same price level. Volume reflects a weakening of the downward pressure, tending to diminish as the pattern forms, with some pickup at each low, less on the second low. Finally the price breaks upward above the highest high to confirm the bullish signal. Recognia has detected an "Engulfing Line (Bearish)" chart pattern formed on iShares Core MSCI Emerging Markets ETF (IEMG:NYSE). This bearish signal indicates that the stock price may fall from the close of $59.53. Tells Me: The recent uptrend is due to reverse, now that selling pressure has overwhelmed prior buying pressure. Following a clear uptrend, we see two candlesticks where the black real body of the second completely envelops the white real body of the first, showing that the bears have taken over from the bulls. Recognia has detected an "Outside Bar (Bearish)" chart pattern formed on iShares Russell 2000 ETF (IWM:NYSE). This bearish signal indicates that the stock price may fall from the close of $158.46. Tells Me: The recent rally is showing signs of exhaustion; we may see lower prices at least in the short term. An Outside Bar (Bearish) develops during a strong uptrend when the trading range completely encompasses the range of the prior bar. This signals an exhaustion of the prior uptrend and potentially a reversal. Recognia has detected a "Top Triangle" chart pattern formed on Columbia Beyond BRICs ETF (BBRC:NYSE). This bearish signal indicates that the stock price may fall from the close of $19.71 to the range of $17.70 - $18.10. The pattern formed over 32 days which is roughly the period of time in which the target price range may be achieved, according to standard principles of technical analysis. Tells Me: The price seems to have reached a top, showing signs of reversal as it has broken downward after a period of uncertainty or consolidation. A Top Triangle shows two converging trendlines as prices reach lower highs and higher (or stable) lows. Volume diminishes as the price swings back and forth between an increasingly narrow range reflecting uncertainty in the market direction. Then well before the triangle reaches its apex, the price breaks down below the lower trendline with a noticeable increase in volume, confirming this bearish pattern as a reversal of the prior uptrend. Recognia has detected a "Triple Moving Average Crossover" chart pattern formed on ISHARES EDGE MSCI MIN VOL USA ETF (USMV:NYSE). This bullish signal indicates that the stock price may rise from the close of $53.39. Tells Me: The price is generally in an established trend (bullish or bearish) for the time horizon represented by the moving average periods. Moving averages are used to smooth out the volatility or "noise" in the price series, to make it easier to discover the underlying trend. By plotting the average price over the last several bars, the line is less "jerky" than plotting the actual prices. In the triple crossover method, a bullish signal is generated when a faster moving average (4 bar) crosses above an intermediate moving average (9 bar), which in turn crosses above a slower moving average (18 bar). In this state, the price is likely in an established uptrend. The opposite is true when the 4 bar crosses below the 9 bar which in turn crosses below the 18 bar, triggering a bearish event. Recognia has detected a "Double Moving Average Crossover" chart pattern formed on iShares Russell 1000 Growth ETF (IWF:NYSE). This bullish signal indicates that the stock price may rise from the close of $143.68. 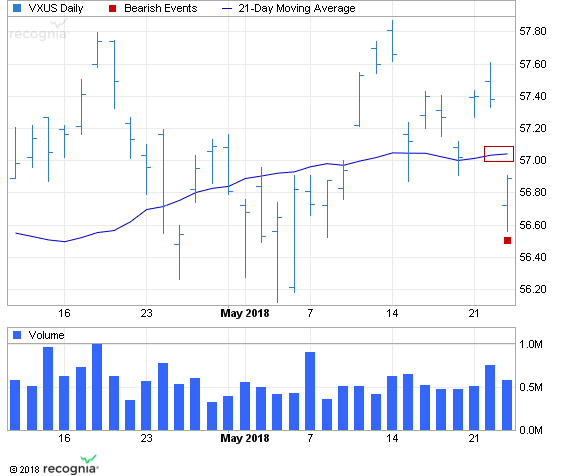 Recognia has detected a "Price Crosses Moving Average" chart pattern formed on ISHARES CORE U.S. AGGREGATE BOND ETF (AGG:NYSE). This bullish signal indicates that the stock price may rise from the close of $106.57. Recognia has detected an "Inside Bar (Bearish)" chart pattern formed on iShares Core MSCI EAFE ETF (IEFA:NYSE). This bearish signal indicates that the stock price may fall from the close of $66.66. Tells Me: The balance between buyers and sellers, recently dominated by the bulls, is evening out. We may see lower prices ahead. An Inside Bar develops during a strong uptrend, when the trading range is completely within the boundaries of the prior bar. This suggests the balance between buyers and sellers is becoming more evenly balanced i.e. a weakening in power for the bulls and increasing in power for the bears. Recognia has detected a "Triple Moving Average Crossover" chart pattern formed on iShares Core MSCI Emerging Markets ETF (IEMG:NYSE). This bullish signal indicates that the stock price may rise from the close of $59.69. Recognia has detected a "Price Crosses Moving Average" chart pattern formed on ISHARES NATIONAL MUNI BOND ETF (MUB:NYSE). This bearish signal indicates that the stock price may fall from the close of $108.38. Recognia has detected a "Price Crosses Moving Average" chart pattern formed on iShares U.S. Treasury Bond ETF (GOVT:NYSE). This bearish signal indicates that the stock price may fall from the close of $24.51. Recognia has detected a "Price Crosses Moving Average" chart pattern formed on ISHARES CORE U.S. AGGREGATE BOND ETF (AGG:NYSE). This bearish signal indicates that the stock price may fall from the close of $106.42. Recognia has detected an "Inside Bar (Bullish)" chart pattern formed on iShares Nasdaq Biotechnology Index Fund (IBB:NASDAQ). This bullish signal indicates that the stock price may rise from the close of $110.54. Tells Me: The balance between buyers and sellers, recently dominated by the bears, is evening out. We may see higher prices ahead. An Inside Bar develops during a strong downtrend, when the trading range is completely within the boundaries of the prior bar. This suggests the balance between buyers and sellers is becoming more evenly balanced i.e. a weakening in power for the bears and increasing in power for the bulls. 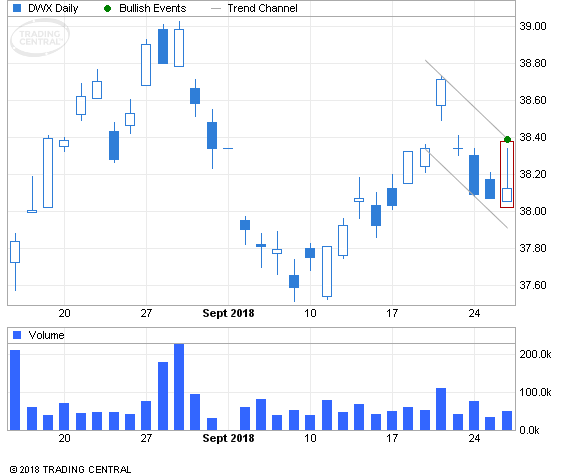 Recognia has detected an "Inside Bar (Bullish)" chart pattern formed on Schwab International Equity ETF (SCHF:NYSE). This bullish signal indicates that the stock price may rise from the close of $33.80. Recognia has detected an "Inside Bar (Bullish)" chart pattern formed on Consumer Discretionary Select Sector SPDR Fund (XLY:NYSE). This bullish signal indicates that the stock price may rise from the close of $104.49. 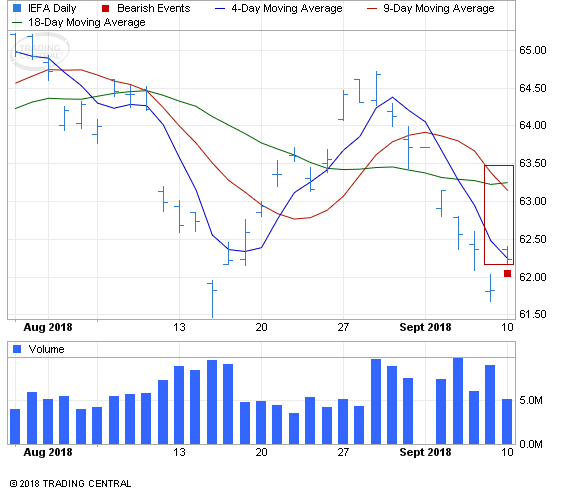 Recognia has detected a "Triple Moving Average Crossover" chart pattern formed on ISHARES GOLD TRUST (IAU:NYSE). This bullish signal indicates that the stock price may rise from the close of $12.93. Recognia has detected a "Price Crosses Moving Average" chart pattern formed on iShares Floating Rate Bond ETF (FLOT:NYSE). This bullish signal indicates that the stock price may rise from the close of $50.94. Recognia has detected a "Price Crosses Moving Average" chart pattern formed on iShares U.S. Treasury Bond ETF (GOVT:NYSE). This bullish signal indicates that the stock price may rise from the close of $24.62. Recognia has detected a "Megaphone Top" chart pattern formed on ISHARES U.S. TECHNOLOGY ETF (IYW:NYSE). This bearish signal indicates that the stock price may fall from the close of $165.68 to the range of $154.00 - $157.00. The pattern formed over 25 days which is roughly the period of time in which the target price range may be achieved, according to standard principles of technical analysis. Tells Me: The recent broadening action tells us that trading has been out of control, but a breakout on the downside suggests we're starting a more decisive downtrend. With its broadening price swings, the Megaphone represents a market that's unstable and out of control. It typically consists of two successively lower lows between three higher highs, and the reversal signal occurs when the price breaks down below the second trough (the lowest lows) as a sign of a more decisive bearish move. 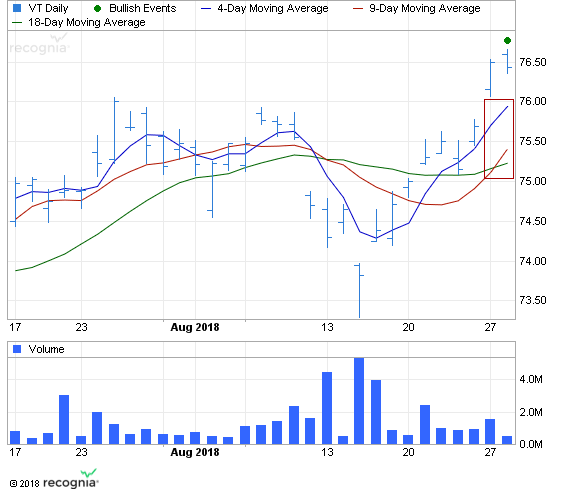 Recognia has detected a "Megaphone Top" chart pattern formed on GUGGENHEIM S&P 500 PURE GROWTH ETF (RPG:NYSE). This bearish signal indicates that the stock price may fall from the close of $108.40 to the range of $99.25 - $101.00. The pattern formed over 22 days which is roughly the period of time in which the target price range may be achieved, according to standard principles of technical analysis. 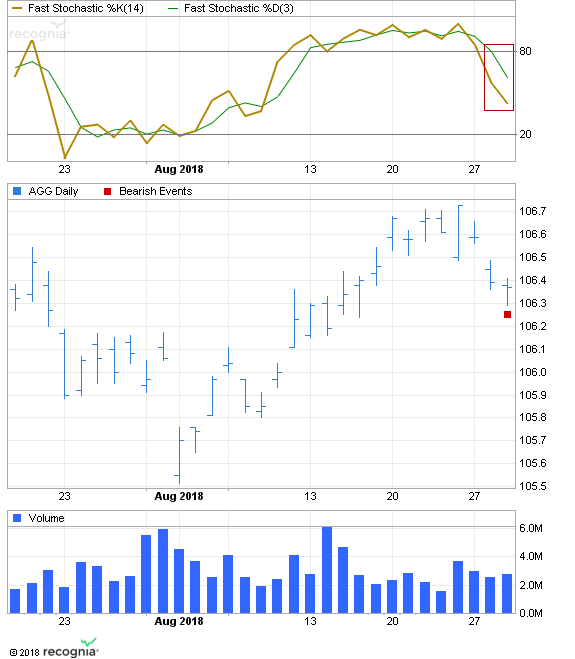 Recognia has detected a "Downside Breakout" chart pattern formed on PowerShares KBW Premium Yield Equity REIT Portfolio (KBWY:NASDAQ). This bearish signal indicates that the stock price may fall from the close of $29.90 to the range of $28.00 - $28.40. The pattern formed over 29 days which is roughly the period of time in which the target price range may be achieved, according to standard principles of technical analysis. Tells Me: The price broke downward out of a trading range suggesting we're entering a new downtrend. The Downside Breakout represents a trading range in which prices move sideways between two parallel horizontal lines. It's often a pause or congestion area within an existing trend though sometimes the breakout results in a reversal to the prior trend. Either way, a downside breakout through the lower support line signals an end to the consolidation period and the start of a downtrend. Recognia has detected a "Double Moving Average Crossover" chart pattern formed on iShares Russell 1000 Growth ETF (IWF:NYSE). This bearish signal indicates that the stock price may fall from the close of $133.99. Recognia has detected a "Price Crosses Moving Average" chart pattern formed on ISHARES GOLD TRUST (IAU:NYSE). This bearish signal indicates that the stock price may fall from the close of $12.73. Recognia has detected a "Downside Breakout" chart pattern formed on VANGUARD ENERGY ETF (VDE:NYSE). This bearish signal indicates that the stock price may fall from the close of $90.38 to the range of $86.40 - $87.20. The pattern formed over 15 days which is roughly the period of time in which the target price range may be achieved, according to standard principles of technical analysis. Recognia has detected a "Price Crosses Moving Average" chart pattern formed on ISHARES NATIONAL MUNI BOND ETF (MUB:NYSE). This bullish signal indicates that the stock price may rise from the close of $108.91. Recognia has detected a "Price Crosses Moving Average" chart pattern formed on SPDR Portfolio Short Term Corporate Bond ETF (SPSB:NYSE). This bullish signal indicates that the stock price may rise from the close of $30.17. Recognia has detected a "Price Crosses Moving Average" chart pattern formed on VANGUARD REIT ETF (VNQ:NYSE). This bullish signal indicates that the stock price may rise from the close of $75.56. Recognia has detected a "Continuation Wedge (Bullish)" chart pattern formed on iShares Russell 1000 Growth ETF (IWF:NYSE). This bullish signal indicates that the stock price may rise from the close of $136.13 to the range of $146.00 - $148.00. The pattern formed over 16 days which is roughly the period of time in which the target price range may be achieved, according to standard principles of technical analysis. Tells Me: After a temporary interruption, the prior uptrend is set to continue. A Continuation Wedge (Bullish) represents a temporary interruption to an uptrend, taking the shape of two converging trendlines both slanted downward against the trend. During this time the bears attempt to win over the bulls, but in the end the bulls triumph as the break above the upper trendline signals a continuation of the prior uptrend. Recognia has detected a "Continuation Wedge (Bullish)" chart pattern formed on iShares Core S&P U.S. Growth ETF (IUSG:NASDAQ). This bullish signal indicates that the stock price may rise from the close of $54.60 to the range of $58.50 - $59.50. The pattern formed over 16 days which is roughly the period of time in which the target price range may be achieved, according to standard principles of technical analysis. Recognia has detected an "Outside Bar (Bullish)" chart pattern formed on SPDR Bloomberg Barclays Short Term High Yield Bond ETF (SJNK:NYSE). This bullish signal indicates that the stock price may rise from the close of $27.26. Tells Me: Selling pressure showing signs of exhaustion; we may see higher prices at least in the short term. An Outside Bar (Bullish) develops during a strong downtrend, when the trading range completely encompasses the range of the prior bar. This signals an exhaustion of the prior downtrend and potentially a reversal. Recognia has detected a "Price Crosses Moving Average" chart pattern formed on SPDR Portfolio Intermediate Term Corporate Bond ETF (SPIB:NYSE). This bearish signal indicates that the stock price may fall from the close of $33.45. 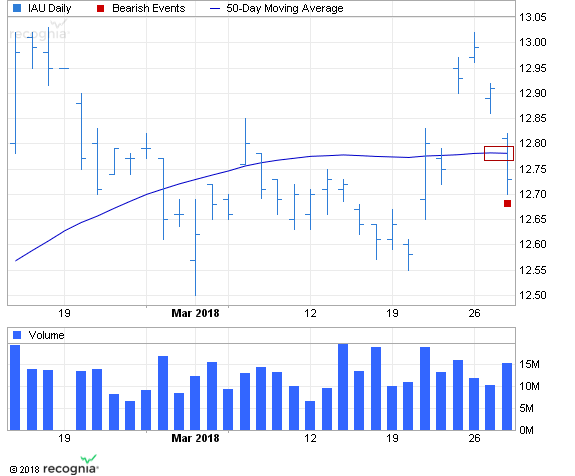 Recognia has detected a "Price Crosses Moving Average" chart pattern formed on SPDR Bloomberg Barclays Intermediate Term Treasury ETF (ITE:NYSE). This bearish signal indicates that the stock price may fall from the close of $58.65. Recognia has detected a "Price Crosses Moving Average" chart pattern formed on VANECK VECTORS AMT-Free INTERMEDIATE Municipal INDEX ETF (ITM:NYSE). This bearish signal indicates that the stock price may fall from the close of $23.45. Recognia has detected a "Price Crosses Moving Average" chart pattern formed on Vanguard Total International Stock ETF (VXUS:NASDAQ). This bearish signal indicates that the stock price may fall from the close of $56.89. Recognia has detected a "Price Crosses Moving Average" chart pattern formed on Schwab International Equity ETF (SCHF:NYSE). This bearish signal indicates that the stock price may fall from the close of $34.33. Recognia has detected a "Price Crosses Moving Average" chart pattern formed on iShares Core MSCI EAFE ETF (IEFA:NYSE). This bearish signal indicates that the stock price may fall from the close of $66.89. Recognia has detected a "Price Crosses Moving Average" chart pattern formed on iShares iBoxx $ High Yield Corporate Bond ETF (HYG:NYSE). This bullish signal indicates that the stock price may rise from the close of $85.65. Recognia has detected a "Key Reversal Bar (Bullish)" chart pattern formed on iShares Core MSCI Emerging Markets ETF (IEMG:NYSE). This bullish signal indicates that the stock price may rise from the close of $56.30. Tells Me: Selling pressure showing signs of exhaustion; we may see higher prices at least in the short term. A Key Reversal Bar (Bullish) develops after a strong decline. The bar shows that the price opened clearly to the downside, preferably a good deal lower than the prior close, but the bears were unable to sustain the move and after developing a wide range, the price closes near or above the prior bar's close. Recognia has detected a "Flag (Bullish)" chart pattern formed on iShares PHLX SOX Semiconductor Sector Index Fund (SOXX:NASDAQ). This bullish signal indicates that the stock price may rise from the close of $186.46 to the range of $203.00 - $207.00. The pattern formed over 7 days which is roughly the period of time in which the target price range may be achieved, according to standard principles of technical analysis. Recognia has detected an "Inside Bar (Bearish)" chart pattern formed on WisdomTree High Dividend Fund (DHS:NYSE). This bearish signal indicates that the stock price may fall from the close of $69.69. Recognia has detected a "Hanging Man" chart pattern formed on iShares Edge MSCI Min Vol Global ETF (ACWV:NYSE). This bearish signal indicates that the stock price may fall from the close of $84.35. Recognia has detected an "Engulfing Line (Bearish)" chart pattern formed on PowerShares KBW Premium Yield Equity REIT Portfolio (KBWY:NASDAQ). This bearish signal indicates that the stock price may fall from the close of $34.22. Recognia has detected a "Price Crosses Moving Average" chart pattern formed on iShares 1-3 Year Treasury Bond ETF (SHY:NASDAQ). This bullish signal indicates that the stock price may rise from the close of $83.25. Recognia has detected an "Inside Bar (Bullish)" chart pattern formed on iShares Agency Bond ETF (AGZ:NYSE). 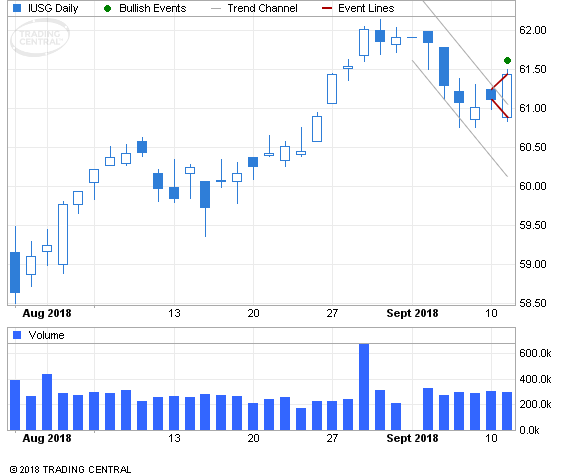 This bullish signal indicates that the stock price may rise from the close of $111.03. Recognia has detected an "Inside Bar (Bullish)" chart pattern formed on ISHARES U.S. OIL EQUIPMENT & SERVICES ETF (IEZ:NYSE). This bullish signal indicates that the stock price may rise from the close of $36.92. Recognia has detected a "Price Crosses Moving Average" chart pattern formed on iShares U.S. Home Construction ETF (ITB:NYSE). This bearish signal indicates that the stock price may fall from the close of $38.97. Recognia has detected a "Price Crosses Moving Average" chart pattern formed on VANGUARD REIT ETF (VNQ:NYSE). This bearish signal indicates that the stock price may fall from the close of $78.98. Recognia has detected a "Triple Moving Average Crossover" chart pattern formed on iShares Core MSCI Emerging Markets ETF (IEMG:NYSE). This bearish signal indicates that the stock price may fall from the close of $54.21. Recognia has detected an "Inside Bar (Bullish)" chart pattern formed on VANGUARD FINANCIALS ETF (VFH:NYSE). This bullish signal indicates that the stock price may rise from the close of $70.06. Recognia has detected an "Inside Bar (Bullish)" chart pattern formed on iShares Core S&P U.S. Value ETF (IUSV:NASDAQ). This bullish signal indicates that the stock price may rise from the close of $54.58. Recognia has detected an "Inside Bar (Bullish)" chart pattern formed on iShares Russell 1000 Value ETF (IWD:NYSE). This bullish signal indicates that the stock price may rise from the close of $122.94. Recognia has detected a "Price Crosses Moving Average" chart pattern formed on SPDR Portfolio Short Term Corporate Bond ETF (SPSB:NYSE). This bearish signal indicates that the stock price may fall from the close of $30.22. Recognia has detected a "Double Moving Average Crossover" chart pattern formed on VANECK VECTORS HIGH-YIELD Municipal INDEX ETF (HYD:NYSE). This bearish signal indicates that the stock price may fall from the close of $31.53. 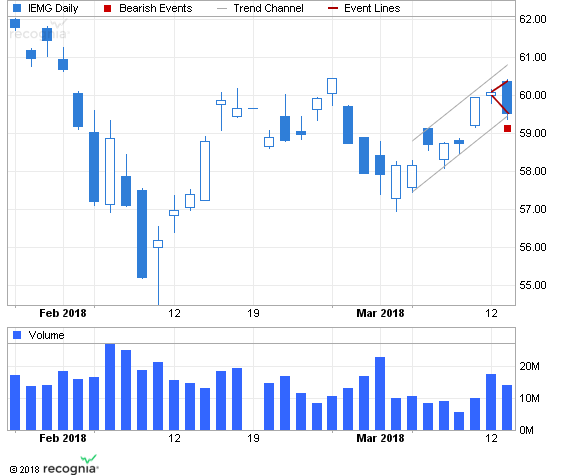 Recognia has detected an "Engulfing Line (Bearish)" chart pattern formed on WISDOMTREE SMALLCAP DIVIDEND FUND (DES:NYSE). This bearish signal indicates that the stock price may fall from the close of $30.48. Recognia has detected a "Price Crosses Moving Average" chart pattern formed on iShares Core MSCI Emerging Markets ETF (IEMG:NYSE). This bullish signal indicates that the stock price may rise from the close of $53.10. Recognia has detected an "Upside Breakout" chart pattern formed on iShares Nasdaq Biotechnology Etf (IBB:NASDAQ). This bullish signal indicates that the stock price may rise from the close of $119.46 to the range of $123.90 - $124.90. The pattern formed over 24 days which is roughly the period of time in which the target price range may be achieved, according to standard principles of technical analysis. Tells Me: The price broke upward out of a trading range suggesting we're entering a new uptrend. The Upside Breakout pattern represents a trading range in which prices move sideways between two parallel horizontal lines. It's often a pause or congestion area within an existing trend though sometimes the breakout results in a reversal to the prior trend. Either way, an upside breakout through the upper resistance line signals an end to the consolidation period and the start of an uptrend. Recognia has detected a "Continuation Diamond (Bullish)" chart pattern formed on iShares PHLX Semiconductor ETF (SOXX:NASDAQ). This bullish signal indicates that the stock price may rise from the close of $189.77 to the range of $219.00 - $226.00. The pattern formed over 129 days which is roughly the period of time in which the target price range may be achieved, according to standard principles of technical analysis. Tells Me: The price has broken upward out of a consolidation period, suggesting a continuation of the prior uptrend. The pattern begins during a downtrend as prices create higher highs and lower lows in a broadening pattern. Then the trading range gradually narrows after the highs peak and the lows start trending upward. When the price breaks upward out of the diamonds boundary lines, it marks the resumption of the prior uptrend. 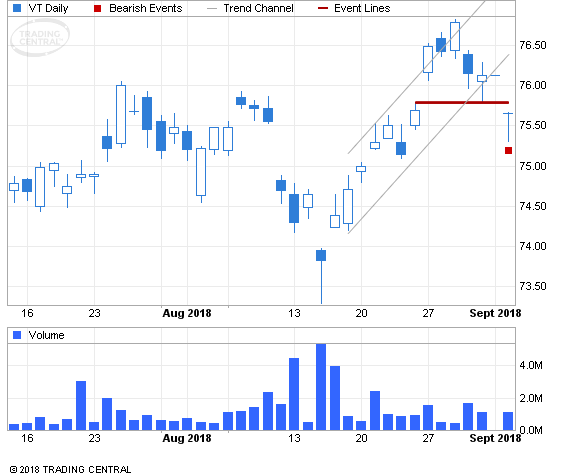 Recognia has detected an "Outside Bar (Bearish)" chart pattern formed on iShares Edge MSCI Min Vol Global ETF (ACWV:NYSE). This bearish signal indicates that the stock price may fall from the close of $86.84. Recognia has detected a "Hanging Man" chart pattern formed on VANGUARD MID-CAP ETF (VO:NYSE). This bearish signal indicates that the stock price may fall from the close of $165.91. Recognia has detected an "Engulfing Line (Bearish)" chart pattern formed on ISHARES GOLD TRUST (IAU:NYSE). This bearish signal indicates that the stock price may fall from the close of $11.52. Recognia has detected a "Triple Moving Average Crossover" chart pattern formed on iShares International Select Dividend ETF (IDV:NYSE). This bullish signal indicates that the stock price may rise from the close of $33.00. Recognia has detected a "Triple Moving Average Crossover" chart pattern formed on VANGUARD TOTAL WORLD STOCK ETF (VT:NYSE). This bullish signal indicates that the stock price may rise from the close of $76.43. Recognia has detected a "Triple Moving Average Crossover" chart pattern formed on iShares Nasdaq Biotechnology Etf (IBB:NASDAQ). This bullish signal indicates that the stock price may rise from the close of $120.05. Recognia has detected a "Fast Stochastic" chart pattern formed on SPDR Portfolio Intermediate Term Corporate Bond ETF (SPIB:NYSE). This bearish signal indicates that the stock price may fall from the close of $33.40. Tells Me: When the event is bullish, we may be facing higher prices as the price has risen out of oversold (%K crossed below 20 then rose again) and starting to trade higher up in the recent 14-bar high-to-low range (%K crossed above %D). The opposite is true for bearish events, where the price has fallen out of overbought and starting to trade lower in the recent high-to-low range. Stochastics is built on the premise that as prices increase, "close" prices tend to be closer to the upper end of the recent price range, and vice versa. The raw %K number looks at the most recent "close" price as a percentage of the high-to-low price range over a specified period of time (14 bars) so when %K is high, it's likely we're seeing upward pressure, and vice versa. %D is a 3-bar moving average of %K and is used as a signal line, indicating whether prices are starting to trade lower or higher within the recent high-to-low range. Both lines fluctuate between 0 and 100 with 20 and 80 often used to identify oversold and overbought conditions. Recognia has detected a "Fast Stochastic" chart pattern formed on iShares Russell 2000 Value ETF (IWN:NYSE). This bearish signal indicates that the stock price may fall from the close of $136.89. Tells Me: When the event is bullish, we may be facing higher prices as the price has risen out of oversold (%K crossed below 20 then rose again) and starting to trade higher up in the recent 14-bar high-to-low range (%K crossed above %D). The opposite is true for bearish events, where the price has fallen out of overbought and starting to trade lower in the recent high-to-low range. Stochastics is built on the premise that as prices increase, "close" prices tend to be closer to the upper end of the recent price range, and vice versa. The raw %K number looks at the most recent "close" price as a percentage of the high-to-low price range over a specified period of time (14 bars) so when %K is high, it's likely we're seeing upward pressure, and vice versa. %D is a 3-bar moving average of %K and is used as a signal line, indicating whether prices are starting to trade lower or higher within the recent high-to-low range. Both lines fluctuate between 0 and 100 with 20 and 80 often used to identify oversold and overbought conditions. Recognia has detected a "Fast Stochastic" chart pattern formed on ISHARES CORE U.S. AGGREGATE BOND ETF (AGG:NYSE). This bearish signal indicates that the stock price may fall from the close of $106.37. Recognia has detected a "Triple Moving Average Crossover" chart pattern formed on Schwab International Equity ETF (SCHF:NYSE). This bullish signal indicates that the stock price may rise from the close of $33.77. In the triple crossover method, a bullish signal is generated when a faster moving average (4 bar) crosses above an intermediate moving average (9 bar), which in turn crosses above a slower moving average (18 bar). In this state, the price is likely in an established uptrend. The opposite is true when the 4 bar crosses below the 9 bar which in turn crosses below the 18 bar, triggering a bearish event. Recognia has detected a "Triple Moving Average Crossover" chart pattern formed on iShares Core MSCI EAFE ETF (IEFA:NYSE). This bullish signal indicates that the stock price may rise from the close of $64.68. Recognia has detected a "Megaphone Bottom" chart pattern formed on iShares PHLX Semiconductor ETF (SOXX:NASDAQ). This bullish signal indicates that the stock price may rise from the close of $191.00 to the range of $203.00 - $206.00. The pattern formed over 27 days which is roughly the period of time in which the target price range may be achieved, according to standard principles of technical analysis. Tells Me: The recent broadening action tells us that trading has been out of control, but a breakout on the upside suggests we're starting a more decisive uptrend. With its broadening price swings, the Megaphone represents a market that's unstable and out of control. It typically consists of two successively higher highs between three lower lows, and the reversal signal occurs when the price breaks up above the second peak (the highest high) as a sign of a more decisive bullish move. Recognia has detected a "Hammer" chart pattern formed on VANGUARD TELECOMMUNICATION SERVICES ETF (VOX:NYSE). This bullish signal indicates that the stock price may rise from the close of $85.98. Tells Me: The price may have reached the bottom of the recent downtrend, having recovered high up from a sharp decline for the session. The Hammer appears during a downtrend, displaying a long lower shadow with a small real body at the top of the range. The price may be developing a bottom and due for a reversal to the upside. Recognia has detected a "Hammer" chart pattern formed on iShares Morningstar Mid-Cap Value ETF (JKI:NASDAQ). This bullish signal indicates that the stock price may rise from the close of $164.09. Recognia has detected a "Double Moving Average Crossover" chart pattern formed on FIRST TRUST DOW JONES INTERNET INDEX FUND ETF (FDN:NYSE). This bullish signal indicates that the stock price may rise from the close of $145.05. Recognia has detected an "Island Top" chart pattern formed on VANGUARD TOTAL WORLD STOCK ETF (VT:NYSE). This bearish signal indicates that the stock price may fall from the close of $75.65. Tells Me: The recent rally has reached a top, signaling a (minor) reversal to the downside. An Island Top forms after a sustained uptrend as a narrow trading range develops that is separated from the previous price action by first an exhaustion gap and then a breakaway gap. Recognia has detected a "Price Crosses Moving Average" chart pattern formed on ISHARES GOLD TRUST (IAU:NYSE). This bearish signal indicates that the stock price may fall from the close of $11.45. Recognia has detected a "Price Crosses Moving Average" chart pattern formed on iShares iBoxx $ High Yield Corporate Bond ETF (HYG:NYSE). This bearish signal indicates that the stock price may fall from the close of $85.81. 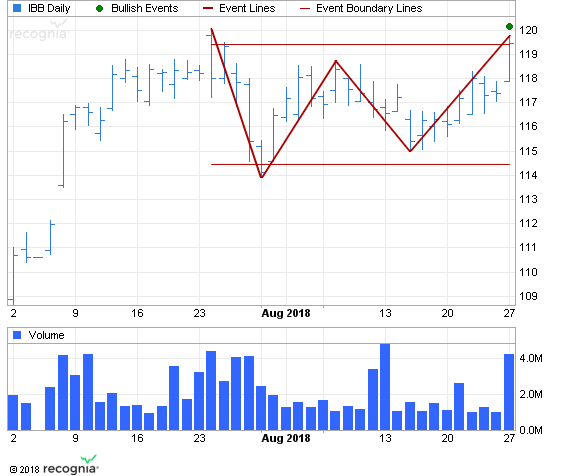 Recognia has detected an "Inside Bar (Bullish)" chart pattern formed on VANECK VECTORS HIGH-YIELD Municipal INDEX ETF (HYD:NYSE). This bullish signal indicates that the stock price may rise from the close of $31.38. Recognia has detected a "Hammer" chart pattern formed on VANGUARD HEALTH CARE ETF (VHT:NYSE). This bullish signal indicates that the stock price may rise from the close of $175.90. Recognia has detected an "Inside Bar (Bullish)" chart pattern formed on Columbia Beyond BRICs ETF (BBRC:NYSE). This bullish signal indicates that the stock price may rise from the close of $17.36. Recognia has detected a "Price Crosses Moving Average" chart pattern formed on VANGUARD TOTAL WORLD STOCK ETF (VT:NYSE). This bearish signal indicates that the stock price may fall from the close of $74.99. Recognia has detected a "Price Crosses Moving Average" chart pattern formed on iShares Nasdaq Biotechnology Etf (IBB:NASDAQ). This bearish signal indicates that the stock price may fall from the close of $118.42. Recognia has detected a "Triple Moving Average Crossover" chart pattern formed on Schwab International Equity ETF (SCHF:NYSE). This bearish signal indicates that the stock price may fall from the close of $32.47. Recognia has detected a "Triple Moving Average Crossover" chart pattern formed on iShares Core MSCI EAFE ETF (IEFA:NYSE). This bearish signal indicates that the stock price may fall from the close of $62.23. Recognia has detected a "Triple Moving Average Crossover" chart pattern formed on iShares Core MSCI Emerging Markets ETF (IEMG:NYSE). This bearish signal indicates that the stock price may fall from the close of $49.80. Recognia has detected an "Inside Bar (Bullish)" chart pattern formed on iShares Russell 1000 Growth ETF (IWF:NYSE). 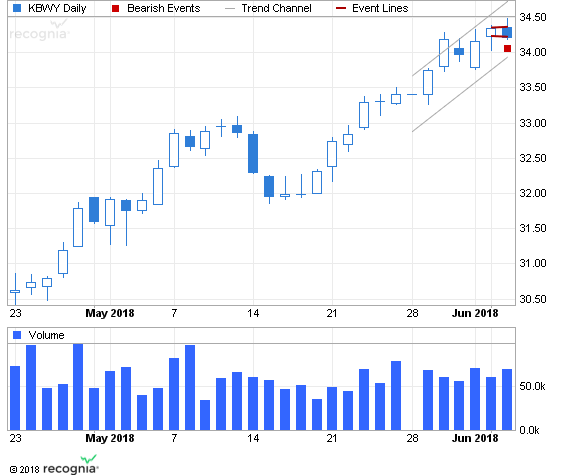 This bullish signal indicates that the stock price may rise from the close of $153.50. Recognia has detected an "Island Bottom" chart pattern formed on Schwab International Equity ETF (SCHF:NYSE). This bullish signal indicates that the stock price may rise from the close of $32.47. Tells Me: The recent decline has reached a bottom, signaling a (minor) reversal to the upside. An Island Bottom forms after a sustained downtrend, as a narrow trading range develops that is separated from the previous price action by first an exhaustion gap and then a breakaway gap. Recognia has detected an "Island Bottom" chart pattern formed on iShares Core MSCI EAFE ETF (IEFA:NYSE). 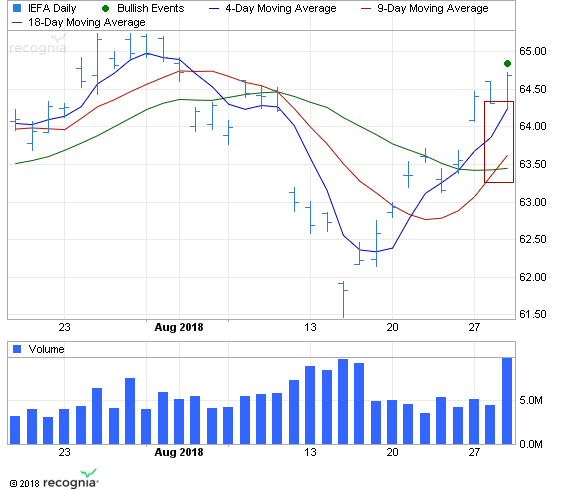 This bullish signal indicates that the stock price may rise from the close of $62.23. Recognia has detected a "Triple Moving Average Crossover" chart pattern formed on VANGUARD TOTAL WORLD STOCK ETF (VT:NYSE). This bearish signal indicates that the stock price may fall from the close of $74.98. Recognia has detected a "Price Crosses Moving Average" chart pattern formed on iShares Nasdaq Biotechnology Etf (IBB:NASDAQ). This bearish signal indicates that the stock price may fall from the close of $117.44. Recognia has detected a "Triple Moving Average Crossover" chart pattern formed on VANGUARD REIT ETF (VNQ:NYSE). This bearish signal indicates that the stock price may fall from the close of $83.22. Recognia has detected an "Engulfing Line (Bullish)" chart pattern formed on iShares Core S&P US Growth ETF (IUSG:NASDAQ). This bullish signal indicates that the stock price may rise from the close of $61.43. Tells Me: The recent downtrend is due to reverse, now that buying pressure has overwhelmed prior selling pressure. Following a clear downtrend, we see two candlesticks where the white real body of the second completely envelops the black real body of the first, showing that the bulls have taken over from the bears. 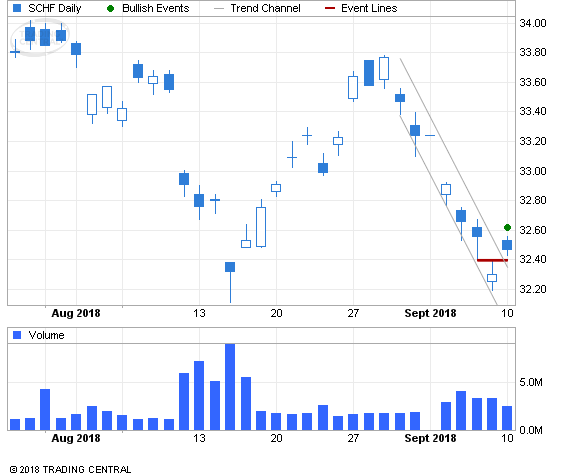 Recognia has detected an "Outside Bar (Bullish)" chart pattern formed on WisdomTree Emerging Markets High Dividend Fund (DEM:NYSE). This bullish signal indicates that the stock price may rise from the close of $42.37. Recognia has detected an "Engulfing Line (Bullish)" chart pattern formed on VANGUARD TOTAL WORLD STOCK ETF (VT:NYSE). This bullish signal indicates that the stock price may rise from the close of $74.98. Recognia has detected a "Triple Moving Average Crossover" chart pattern formed on iShares Russell 1000 Value ETF (IWD:NYSE). This bearish signal indicates that the stock price may fall from the close of $126.98. Recognia has detected a "Price Crosses Moving Average" chart pattern formed on iShares Russell 2000 Value ETF (IWN:NYSE). This bearish signal indicates that the stock price may fall from the close of $134.77. Recognia has detected a "Price Crosses Moving Average" chart pattern formed on iShares Russell 2000 ETF (IWM:NYSE). This bearish signal indicates that the stock price may fall from the close of $170.62. Recognia has detected a "Price Crosses Moving Average" chart pattern formed on iShares iBoxx $ High Yield Corporate Bond ETF (HYG:NYSE). This bullish signal indicates that the stock price may rise from the close of $86.09. Recognia has detected an "Inside Bar (Bullish)" chart pattern formed on SPDR Bloomberg Barclays Intermediate Term Treasury ETF (ITE:NYSE). 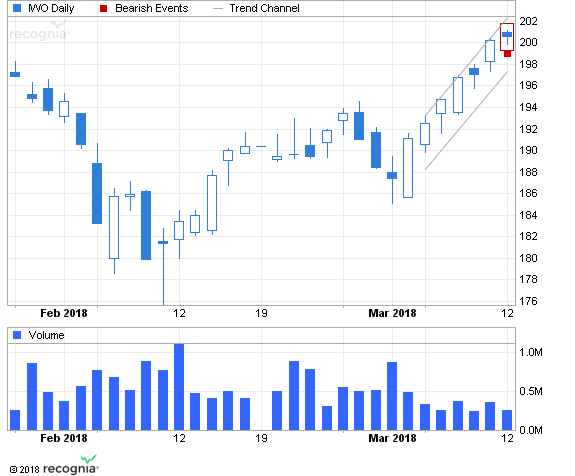 This bullish signal indicates that the stock price may rise from the close of $58.34. Recognia has detected a "Hammer" chart pattern formed on iShares Nasdaq Biotechnology Etf (IBB:NASDAQ). This bullish signal indicates that the stock price may rise from the close of $117.50. Recognia has detected an "Outside Bar (Bearish)" chart pattern formed on ISHARES U.S. TECHNOLOGY ETF (IYW:NYSE). This bearish signal indicates that the stock price may fall from the close of $192.06. Recognia has detected a "Flag (Bearish)" chart pattern formed on Global X SuperDividend ETF (SDIV:NYSE). This bearish signal indicates that the stock price may fall from the close of $20.19 to the range of $19.40 - $19.55. The pattern formed over 11 days which is roughly the period of time in which the target price range may be achieved, according to standard principles of technical analysis. Tells Me: The price seems to be resuming a sharp decline after taking a brief pause. 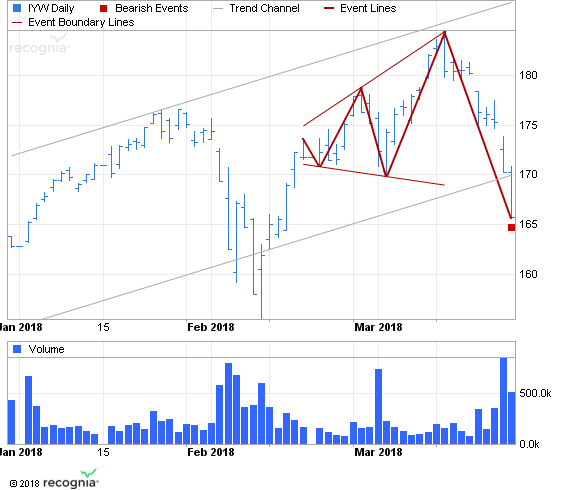 A bearish Flag pattern occurs during a dynamic market decline, representing a brief pause as the market "catches its breath" before running off again in the same direction. The pattern consists of two parallel trend lines, often sloping upward against the prevailing downtrend, and is confirmed when the price breaks down through the lower boundary to resume the decline. Recognia has detected a "Megaphone Top" chart pattern formed on VANGUARD FINANCIALS ETF (VFH:NYSE). This bearish signal indicates that the stock price may fall from the close of $70.21 to the range of $67.80 - $68.30. The pattern formed over 26 days which is roughly the period of time in which the target price range may be achieved, according to standard principles of technical analysis. Recognia has detected a "Triple Moving Average Crossover" chart pattern formed on ETFS SILVER TRUST (SIVR:NYSE). This bullish signal indicates that the stock price may rise from the close of $13.98. Recognia has detected a "Double Moving Average Crossover" chart pattern formed on iShares iBoxx $ High Yield Corporate Bond ETF (HYG:NYSE). This bullish signal indicates that the stock price may rise from the close of $86.22. Recognia has detected an "Inverted Hammer" chart pattern formed on SPDR S&P International Dividend ETF (DWX:NYSE). This bullish signal indicates that the stock price may rise from the close of $38.12. Tells Me: The recent decline is approaching its bottom, as the balance between buyers and sellers evens out and there's an attempt (though failed) at higher prices. The Inverted Hammer appears during a downtrend with a long upper shadow reflecting an attempt a higher prices, and a small real body at the lower end of the range reflecting an evening out of the balance between buyers and sellers as the bears have lost some control. The price may have reached a bottom and ready to turn higher. Recognia has detected an "Inside Bar (Bullish)" chart pattern formed on Consumer Discretionary Select Sector SPDR Fund (XLY:NYSE). This bullish signal indicates that the stock price may rise from the close of $106.77. 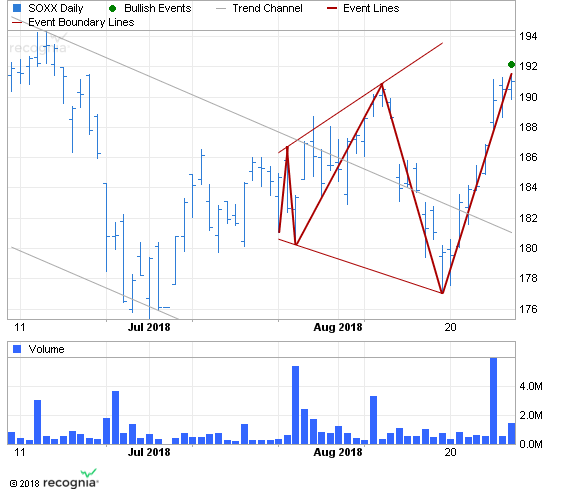 Recognia has detected an "Inside Bar (Bullish)" chart pattern formed on iShares PHLX Semiconductor ETF (SOXX:NASDAQ). This bullish signal indicates that the stock price may rise from the close of $167.20. Recognia has detected a "Triple Moving Average Crossover" chart pattern formed on iShares 1-3 Year Treasury (SHY:NASDAQ). This bullish signal indicates that the stock price may rise from the close of $82.93. Recognia has detected a "Triple Top" chart pattern formed on iShares U.S. Oil & Gas Exploration & Production ETF (IEO:NYSE). This bearish signal indicates that the stock price may fall from the close of $69.50 to the range of $60.75 - $62.50. The pattern formed over 119 days which is roughly the period of time in which the target price range may be achieved, according to standard principles of technical analysis. Tells Me: The price may have hit a top and seems to be turning around to form a new downtrend The Triple Top starts with prices moving upward followed by three sharp peaks all at about the same price level showing a test of a resistance level. Volume diminishes at each successive peak and finally bursts as the price falls below the lowest low--a decisive breach of that support level. This breakout confirms the pattern as a sign of BEARISH price reversal. 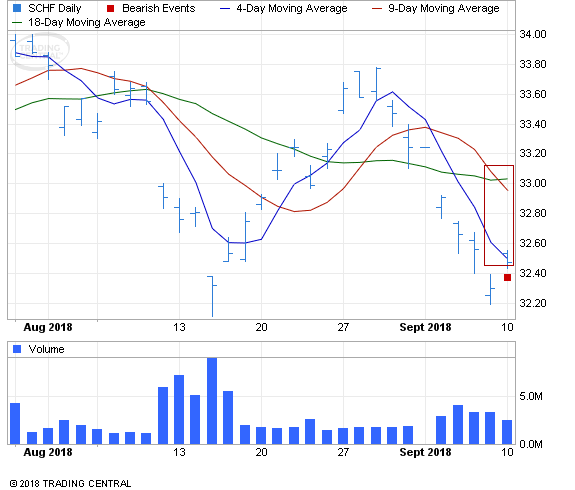 Recognia has detected an "Outside Bar (Bearish)" chart pattern formed on VANGUARD REIT ETF (VNQ:NYSE). This bearish signal indicates that the stock price may fall from the close of $77.03. Recognia has detected an "Engulfing Line (Bearish)" chart pattern formed on WisdomTree High Dividend Fund (DHS:NYSE). This bearish signal indicates that the stock price may fall from the close of $70.37. Recognia has detected a "Price Crosses Moving Average" chart pattern formed on iShares Floating Rate Bond ETF (FLOT:NYSE). This bearish signal indicates that the stock price may fall from the close of $50.95. Recognia has detected a "Key Reversal Bar (Bullish)" chart pattern formed on Schwab International Equity ETF (SCHF:NYSE). This bullish signal indicates that the stock price may rise from the close of $30.98. 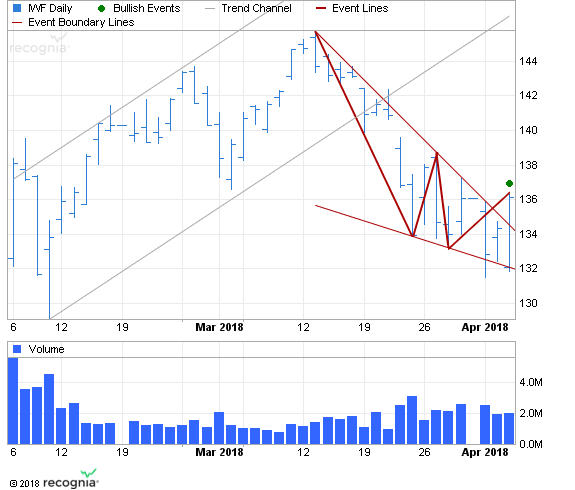 Recognia has detected a "Megaphone Top" chart pattern formed on ISHARES U.S. TECHNOLOGY ETF (IYW:NYSE). This bearish signal indicates that the stock price may fall from the close of $171.78 to the range of $153.00 - $158.00. The pattern formed over 117 days which is roughly the period of time in which the target price range may be achieved, according to standard principles of technical analysis. Recognia has detected a "Price Crosses Moving Average" chart pattern formed on iShares U.S. Treasury Bond ETF (GOVT:NYSE). 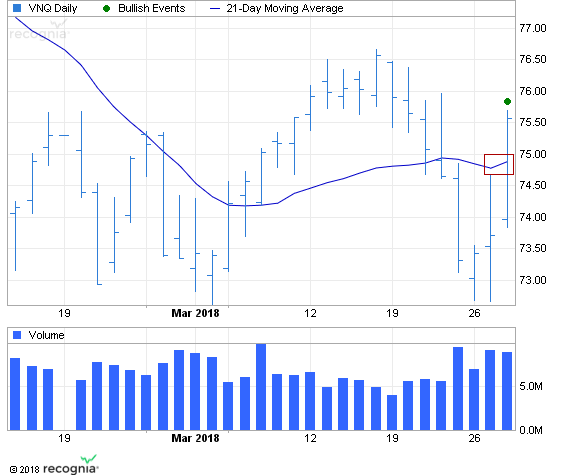 This bullish signal indicates that the stock price may rise from the close of $24.27. Recognia has detected a "Price Crosses Moving Average" chart pattern formed on SPDR Portfolio Intermediate Term Corporate Bond ETF (SPIB:NYSE). This bearish signal indicates that the stock price may fall from the close of $33.03. Recognia has detected an "Inside Bar (Bullish)" chart pattern formed on Consumer Discretionary Select Sector SPDR Fund (XLY:NYSE). 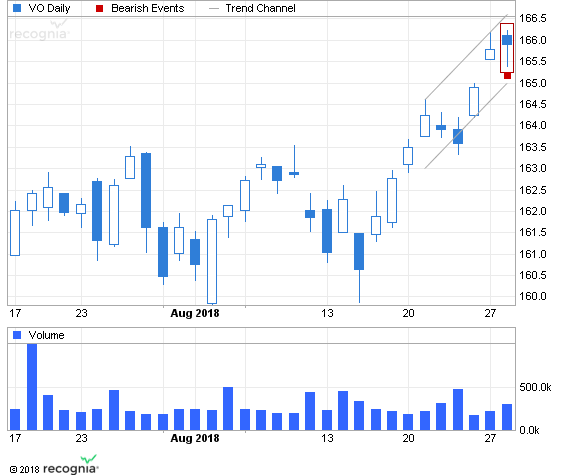 This bullish signal indicates that the stock price may rise from the close of $104.04. Recognia has detected a "Price Crosses Moving Average" chart pattern formed on Consumer Discretionary Select Sector SPDR Fund (XLY:NYSE). This bullish signal indicates that the stock price may rise from the close of $108.60. Recognia has detected a "Triple Moving Average Crossover" chart pattern formed on VANECK VECTORS HIGH-YIELD Municipal INDEX ETF (HYD:NYSE). This bearish signal indicates that the stock price may fall from the close of $60.32. Recognia has detected a "Symmetrical Continuation Triangle (Bearish)" chart pattern formed on iShares Russell 2000 Growth ETF (IWO:NYSE). This bearish signal indicates that the stock price may fall from the close of $183.68 to the range of $164.00 - $167.00. The pattern formed over 15 days which is roughly the period of time in which the target price range may be achieved, according to standard principles of technical analysis. Tells Me: The price has broken downward out of a consolidation period, suggesting a continuation of the prior downtrend. A Symmetrical Continuation Triangle (Bearish) shows two converging trendlines as prices reach lower highs and higher lows. Volume diminishes as the price swings back and forth between an increasingly narrow range reflecting uncertainty in the market direction. Then well before the triangle reaches its apex, the price breaks down below the lower trendline with a noticeable increase in volume, confirming the pattern as a continuation of the prior downtrend. Recognia has detected a "Price Crosses Moving Average" chart pattern formed on ISHARES GOLD TRUST (IAU:NYSE). This bullish signal indicates that the stock price may rise from the close of $11.73.